(trigger points) Effective relief for muscle pain. A classic approach for total relaxation. Relax and relieve back pain. Release tension in the body through the arch of your foot. Improve spinal flexibility and relieve back pain. The therapeutic power of basalt stones. At our centre or your home, business, conference or golf tournament. A blissful experience for two. At home, at the office or on the golf course—we’ll come to you. For immediate relaxation, deeper sleep and energy rebalancing. Prevent tight muscles and injuries. Detox your body and boost your immune system. (TNC) Treat chronic pain, injuries, scars, arthritis, etc. Forget cancer and enjoy the moment. Jin shin do technique based on acupuncture points. 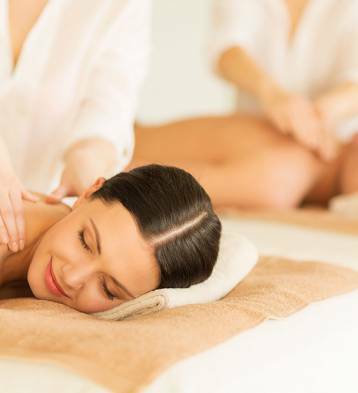 Become a professional massage therapist. Learn a highly effective technique for softening muscles and relieving tension. The centre is beautiful and nicely decorated, and everyone there is very enthusiastic. Owner Denise Guerra is always looking to make a difference with exceptional service. You’ll get a warm welcome, personalized service, a team you can trust and a soothing environment. With their package deal, it’s easy to get used to a monthly massage! I always look forward to my appointments because I know I’ll be well cared for. The team’s approach and warm welcome always make me feel important! I always feel like a VIP. The exceptionally competent massage therapists and the staff’s people skills have won me over and made me into a loyal customer. Beyond the instant relief, I’m impressed at how much better I feel since discovering the therapeutic massages at Armonia! The neuromuscular technique used by Armonia therapists is just incredible. After suffering from fibromyalgia for 25 years and recovering after hypnotic regression to find the cause (an emotional one), my body had an incredible amount of tension stored inside. During all those years, I consulted with practitioners from various disciplines looking for relief—at tremendous financial cost. Recently, a friend told me about Denise Guerra who manages Armonia. Just five sessions later, my body responded to the treatment in the most extraordinary way. For instance, I used to only be able to lift my left leg six inches off the ground, but now I can cross it over my right knee. All the stiffness in my back, arms and neck has let go. I no longer get out of bed like a 90-year-old mother goose—I’m a spry 69-year-old spring chicken! If you’re unsure about trying Armonia, my advice is to give it four sessions and you’ll feel the difference. After finally finding competent therapists, I urge you to stop suffering.